They do random searches every so often at WMATA stations in DC too. Of course, as soon as the plan was announced people pointed out how anyone with any intention at all of getting around them could do so (like just declining a search or going to another entrance). Of course there were the ‘it is marginally more safety than nothing, why do you not like my safety, please do not hurt me, please do not say how terrorists can avoid them’ people. Rochester, N.Y. — She says she had no warning that someone was going to search her car after she left to catch her flight. So the woman contacted News10NBC. So if security feels it is necessary to search some cars in the name of safety, why not search all of them? Iacuzza’s car was inspected by valet attendants on orders from the TSA. But why only valet parked cars? That’s what News10NBC wanted to ask the TSA director about. We reached him by phone. Iacuzza said she doesn’t mind the security measure. She just wants to be told if her car is getting searched. News10NBC asked the owner of the company that runs the valet parking when they put up the sign but he wouldn’t answer. TSA says this is part of its overall security plan and that it’s a proactive move. The attendants said they’ve only been doing it for about a month. Fourth Amendment need not apply as the TSA search is administrative versus police. Not saying I agree, just that this is the reality for the present. hey can only ask, the courts have all affirmed this. 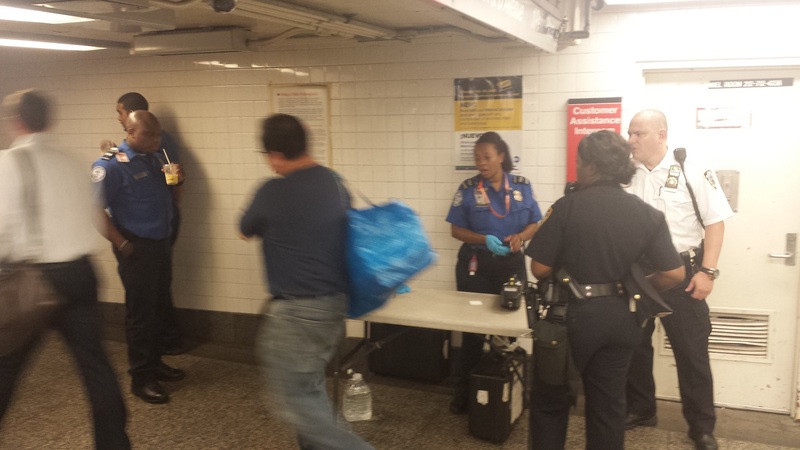 Even Commissioner ray Kelly, has said you are free to go to another entrance to bypass the bag checkpoints. There are other ways through it was well, I often “don’t ” hear them and swipe my metrocard in the turnstile, I paid my fare, and since the MTA doesn’t allow reimbursements, the Police have to let you through the turnstile with unchecked bags. I have gotten around this multiple times. i always demand my $2.25 metrocard fare replaced if they are refusing access when I have paid my fare. The Police have on numerous occasions have tried to force me to submit, when I tell them “I do not consent to a search” and unless they can articulate a reasonable suspicion that I have indeed or am about to commit a crime, I am free to go on my way. They then try to state that they can refuse access, but then I retort I have already paid my fare and that the would need to reimburse my metrocard the fare. A few have tried to get the token booth clerks to, but they can not as they are not authorized. So they have to allow you through without a checked bag – if they actually prevent you from swiping, then just re-enter at next entrance. A New York woman who used a valet service recently to park her car at Greater Rochester International Airport discovered upon her return, through a notice left on her car, that it had been searched under TSA regulations without her consent. Furious, she got in touch with a local TV station, and the story went viral. TSA quickly put out a statement saying that its agents don’t search cars—but searches can be included in a TSA-approved security plan. Mother Jones has found that not only does TSA approve searches of the trunks and interior of unattended cars in an undefined perimeter that’s considered dangerously close to the airport—like a car left with valet parking—but if a valet attendant finds illegal drugs instead of bombs, they will call the police. Privacy experts say these searches could be a violation of a person’s Fourth Amendment rights. As David Castelveter, a spokesman for TSA explains, each airport in the United States is required to come up with a TSA-approved plan to deal with security risks. That includes “unattended vehicles parked curbside at the terminal.” Approved measures to deal with that risk can include “searches of cars queued for curbside valet parking” (not all airports have valet services, but those that do tend to leave the cars in lots close to the airport.) Mother Jones asked Castelveter whether the definition of “curbside” can include any parking lot close to the airport—including those that may contain locked, non-valet cars—but he said TSA looks at each airport security plan on a “case-by-case basis.” Obviously, valet cars are easier to search than other vehicles, as the valet company has the keys. The airports Mother Jones contacted didn’t all handle valet car searches the same way. At the Minneapolis-St. Paul International Airport, valet parking is underneath the terminal, so a security guard does a quick trunk search when the drivers are in the car. The same thing happens at the Nashville International and at Logan Airport in Boston. As Richard Walsh, a spokesman for Massachusetts Port Authority explains, “If a driver does not wish to participate in this procedure, he/she will be directed to park in the Central garage.” An attendant for the valet at San Francisco International Airport said “yes, we can search” before changing his mind and adding “we just check the outside of the car. We just take down license plates. I’m not allowed to give you an answer.” At Los Angeles International Airport, the valet attendants open the trunk to search for valuables that might be stolen while the person is gone, and list them on a piece of paper, but don’t “look for specific stuff” related to security, according to an attendant. What about the former head of the TSA, Kip Hawley? Remember when he scrapped the absurd rules that made everyone’s life miserable and forced children and the elderly to be groped by blue-shirted agents for got their jobs off pizza boxes? Neither do I. According to a new report (http://www.gao.gov/assets/660/656301.pdf ) from the federal Government Accountability Office, the TSA investigated a total of 9,622 misconduct cases between 2010 and 2012. In that time, the annual number of cases increased from 2,691 to 3,408. There are approximately 56,000 TSA staffers, so that means that about 1-in-16 employees of the agency was investigated last year. The purpose of the GAO review was to evaluate the nature of these misconduct investigations, and to look at how the agency manages the investigation and resolution process. While this might not seem a bit nitpicky to focus on people who overslept or were taking days off they shouldn’t, remember what it’s like to stand in line at airport security while you stare at the lines of screening devices that go unused because there aren’t enough people to work there. In a more general picture, think of all the people that would be happy to have that job but who lost out to the guy who slept through his alarm that morning. This is the one that TSA critics can point to as evidence that the agency has simply gotten lucky that more lethal devices haven’t slipped through. Overall, 47% of misconduct investigations ended with the dreaded letter of reprimand, showing that the TSA is truly taking homeland security seriously. That said, 31% resulted in a suspension for a definite period of time (only 1% ended in indefinite suspension), while 17% were dismissed from their jobs. Another 4% resigned or retired before a final ruling was handed down. GAO also identified problems with the way in which TSA conducts its investigations, like how the agency doesn’t check to see that the people conducting the investigations are themselves following the rules. Think of it like the officiating staff who review baseball umpires and NFL referees to make sure they are doing their jobs properly. TSA doesn’t have that. “Issuing guidance to TSA staff at airports about recording all case outcomes in the database would emphasize management’s view of the importance of staff including such information to provide a more complete record of adjudication decisions,” explains GAO. Researchers pulled a random sample of 50 allegations referred from the Department of Homeland Security Office of Inspector General (DHS OIG) to TSA in fiscal year 2012, GAO found that 2 were not adjudicated by TSA. After this was brought to TSA’s attention, it finally investigated these cases, one of which resulted in a 14-day suspension. That employee would have otherwise gotten away with the misconduct because of holes in the TSA process. GAO cautions against extrapolating the 4% failure rate found in that 50-case sample to the full list of 1,300 allegations referred to TSA by the Office of the Inspector General in 2012 alone. In a preliminary ruling in a lawsuit brought by the ACLU three years ago on behalf of a group of people who have been prevented by the U.S. government from traveling by air, a Federal judge in Oregon has found (1) that international air travel is a Constitutional right, and (2) that a categorical ban by the government on the exercise of that right can only be issued in accordance with due process. Those shouldn’t be surprising findings. But given that the U.S. government has never sought to follow normal legal procedures by asking a court to issue a no-fly injunction against an individual, and that none of the goverment’s extrajudicial administrative no-fly orders has ever been reviewed on its merits by any court, the latest ruling by District Judge Judge Anna Brown in the case of Latif et al. v. Holder is an important step toward bringing DHS controls on travel within the rule of law. The ruling is the latest in a series of decisions which have finally begun to uphold the right of travelers to due process and juducial review of the restrictins on their movements. The decison in the Oregon no-fly case echoes similar findings in the past year by the 4th Circuit Court of Appeals in the case of Gulet Mohamed and by the 9th Circuit and the District Court for the Northern District of California in the case of Rahinah Ibrahim. The government will neither confirm nor deny whether anyone is or has ever been on the government’s no-fly list. But each of the plaintiffs in the Oregon lawsuit has been prevented from boarding international flights to and/or from the USA, or has been on a flight that was denied permission to land in the USA becuase they were on board. The government first tried to claim that the court had no jursidiction to hear such a case at all. After that argument was rejected by the 9th Circuit on appeal, the government tried to get the complaint dismissed on the grounds that the plaintiffs’ rights hadn’t been violated, even if the government had forbidden airlines to transport them, they could have traveled by other means.